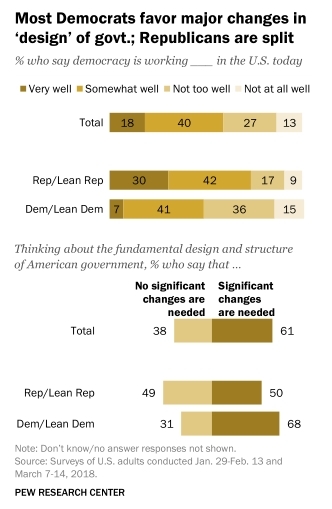 Electoralism and alternatives: Most say the design and structure of government need big changes. 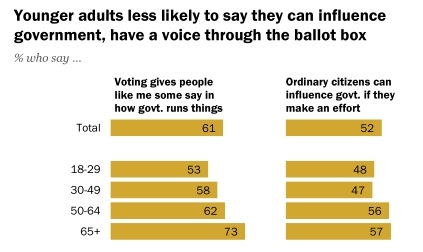 Younger people are less likely to say that voting gives them a say. Compared to 2015 fewer Americans say ordinary people would do a better job than elected officials. Support for this idea is now negatively correlated with age. Confidence: As usual, confidence in elected officials is found to be very low. The military and scientists enjoy much higher confidence. 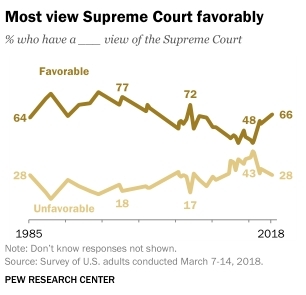 The Supreme Court is also viewed favorably. 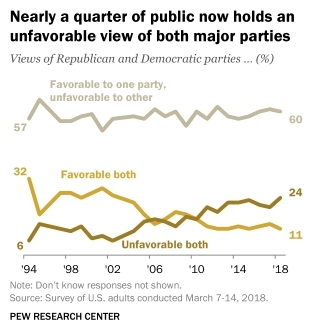 A steadily growing percentage of Americans (now about 25%) view both parties unfavorably. How do you explain this apparent paradox? One explanation would be that the views of “a few big interests” are an (epistemic?) improvement on the views of most Americans (especially given the reported public confidence in the military and scientists). Maybe expectations are rather low. The economic situation in the US has been slowly improving over the last few years, so the system is working “somewhat well” in the sense that things could certainly be much worse. The U.S. constitution is revered as a quasi-religion text. Any question that hints at flaws in our secular bible is bound to get a negative response. This is changing among Democrats, particularly with respect to the Electoral College and the Senate. The chart says ‘Fewer Republicans now say…’. And I wondered why the poll only chose Republicans for that point? When I clicked on the full article I did not find that chart or issue. The finding is shown on page 79 of the full report [PDF]. The average for the entire population has decreased by about 10%. This is caused by a large decrease among Republicans (from 62% to 43%) and a small decrease among Democrats (from 49% to 45%). OK, then “Most Americans do not believe that government policies reflect the views of most Americans” is true in the sense that Trump did not secure a popular majority. 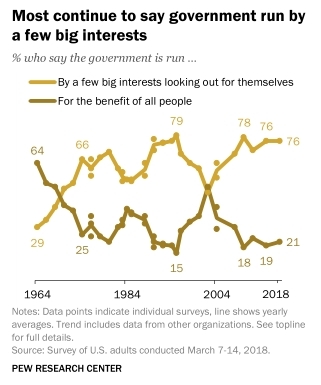 Given that the electoral Bell Curve has been replaced by a bipolar distribution then the above statement is true, even if you don’t believe that elected governments pursue the interests of the rich ‘n powerful. It’s also the case that election by lot would make little difference to the bipolar distribution (unless you claim that the cleavage is manufactured by political parties). We’re very aware of this in the UK at the moment as, notwithstanding the ambitions of individual politicians, the issue of whether to Brexit or Remain is a binary choice over which voters are evenly divided. It’s not a paradox. A “government policy” is an observable fact, while “democracy” is an ideal idea, subject to a lot of interpretation. If the former is judged to be worse it means that the latter does not (yet) live up to its ideal potential. Due to badly designed institutions, I may add. 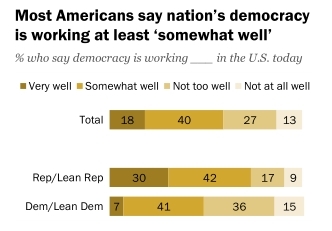 It’s not a distinction between facts and values, as democracy aims to transfer power from oligarchies (“a few big interests”) to the demos (“most Americans”) yet most respondents “say that American democracy works [my emphasis] very or somewhat well”. The question is over how democracy functions, rather than the foundational ideals.